Somewhere far north of the quaint town of Winterwynd, an albino goatherd stood side by side with a speckled Wolverthorne and their Ravenking. Early evening was settling over the Vale, and its activity gradually slowed to a lull. Just as Calia hoped, the coming night chased away the blazing heat of midday, bringing with it a cool breeze from the river. Hands clasped in front of her, Calia inclined her head towards Saga with a smile. ”We shall begin soon, my dear!” the Nightstag spoke in an excited titter, her tail wagging happily behind her. It was hard to believe that this day had come so soon. It seemed like just yesterday, a group of rogues and vagabonds followed the heels of their newly appointed leaders into the Vale. But during these past few months, one founding member soared above the rest - quite an impressive feat, given the dedication of all of the Vale’s Mistwalkers. It was only appropriate that Saga D’Angelo be appointed to Starkhelm. Without a quick smile aimed towards Felix and Saga, Calia’s head tilted back to release a long, wolfish howl. It didn’t take long for the Mistwalkers to respond to their Nightstag’s summons - they came in an orderly fashion, in twos or threes. Crimson eyes scanned the crowd, doing a silent headcount. Satisfied, the goatherd’s expression broke into a beaming grin. ”Welcome, welcome!” Calia spoke with grandeur, addressing the mass of her Packmates with the facade of the Old Brassard Church as her backdrop. ”We gather here together as a Pack to celebrate the accession of one of our very own.” At this, the Nightstag offered a friendly wink to Saga. ”Now please, join us in an evening of drink and festivities!” Calia’s voice took on a mischievous tone as she pushed the Church’s doors inwards. Felix had brought down a buck not too long ago, and choice cuts of meat adorned the long, banquet style tables that lined one wall. Doused in an array of smokes and herbs - or, served raw to suit more feral tastes - the meat was arranged in a buffet style. A hefty amount of drinks adorned the table as well - including the nightstag’s own kumis addition. The news of her promotion had been a shock. She'd expected it of course, at some point, but there had always been the assumption that the gratification would be delayed. Who would think to put a yearling at the top rung of such a level-headed, realistic house? She'd obviously been a member longer than Linden and had made quicker advance that Ragna, but if anything she had expected to be passed over in favour of them for a long while. Experienced, older, world-weary, and battle-scarred. Nevertheless, she was honoured by the move and had gleefully, yet in a reposed manner, accepted the offer of a celebration in her honour. Everyone eventually filtered into view, clustered around the table that had been carefully laid in front of the old church's wide double doors. It wasn't long before Calia spoke, her strange accent chiming clearly. No sooner was the word "Starkhelm" proclaimed before Saga took a measured step forward. A brief, respectful nod was all she offered her packmates, her signature sage silence more than enough to show her pleasure. Zuri's home was coming together nicely. It was easy enough to set up a place for her own living space, having used the pelts she had gathered from Mortimer to use as her own begging. It wouldn't be quite as nice as what she had back home, but there was always the chance of being able to put her trading to use in order to upgrade anything she started out with. The same could be said for the small table and chairs she had gathered from one of the other nearby houses. It's not like anyone was using them, and she needed a place for guests to sit when they came over. There was still so much more work to do along the inside of her home, but there would be time for that. It would be something to work on with some downtime. Right now, there was still more exploring to be done, and organizing to take care of. The pale woman's upright ear turned to the side at the sound of the call. Considering the volume of it, wherever this summon was to take place was somewhere nearby. Dropping her current project, she stepped outside of her home, joined by both of her bats along her shoulders. A smile moved across her face, head turning up towards the sky. Night was coming to the land, so it was no surprise they were getting more active. Back feet carried her in the direction of the sound, coming near the church itself. There were others here, some she recognized and others she did not. Zuri's crimson gaze moved up to the two leaders and the spotted woman at their side. Focus moved to Calia as she began to speak, claiming the accession of this spotted woman to the rank of 'Starkhelm'. This title, as the leader put it, came with great honor, and no doubt a lot of hard work. Was there one for each of these houses that the members were placed into? Well then, now the pale woman had another goal to reach for in the future. As the announcement came to a close, Zuri stepped forward, giving some space between herself and the newly ranked member. It was more so for her companions above anything else. A small smile crept along her face before she spoke, "Congratulations on your accession Starkhelm." “Time time?” The marten chattered excitedly as soon as he had heard the distant, summoning howl made by the Nightstag. 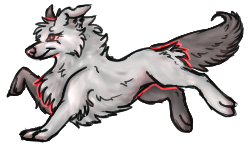 He paced around in circles impatiently, wishing his Luperci companion would move faster out the door. Glade had been excited ever since news had leaked out about a surplus of food being prepared. Such things usually only meant one thing; a feast was to soon be had! “Yes, it’s time,” she told him with a sigh, grabbing the mustelid by his slinky body and bringing him up so that he could perch across her shoulders. His little hands held onto the fabric of her vest as she slipped out the door and into the town. The horses bid them farewell as they made their way to the Old Brassard Church. They were amongst the few handful to arrive, and the marten cocked his head curiously upon seeing Saga standing up on the steps with the Nightstag and Ravenking. He pawed at Ragna’s neck fur, and she gave him a sidelong glance. Without words, she communicated that she did not know the answer to his unasked question. In due time though, she was sure, they’d be told why. And, sure enough, once the pack had been gathered, Calia addressed them, and the reasoning for why Saga stood beside her and Felix was explained. The yearling Wolverthorne was to be named the leader of the Wolverthorne house, their Starkhelm. Ragna let out a sharp exhale, the corner of her mouth twisting into a slightly amused smirk. 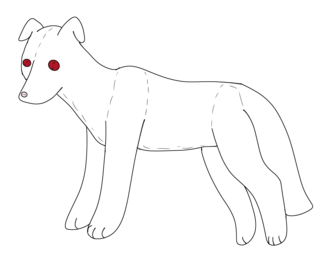 The kid had come quite a ways from the unshifted child that she had once been at the pack’s founding, running alongside Ragna during the pack’s first official hunt as Mistwalkers. She had done much more for the pack since its founding than most, it seemed. Good for her that she was noticed. Time would tell if the young D’Angelo was fit to lead those of her house. With the announcement of the promotion completed, Calia opened the church doors to reveal the banquet that Glade had, undoubtedly, been waiting for since they had gathered there. As the crowd moved in to eat, a few seemed to offer their congratulations to the newly promoted Starkhelm. When Ragna came to pass the young girl, she had intended little more than a nod of approval to her. However, given what the promotion meant, the ex-soldier figured that it was worth more than a silent gesture. “Lead us well, Starkhelm.” Ragna said, her glacier eyes passing coolly over the mottled Wolverthorne. Glade decided to chime in too, “’Grats, Saga! Thanks for food lots too!” Of course, the food. He was excited because her promotion had brought about the surplus of delicious-smelling food. The call was unexpected, but it certainly served to pull Cairina off a particularly strong practice session. Being already on her mare, she took off towards her den. The call was a long time coming, her knowing of Saga's quick rise in the pecking order would eventually lead to a celebration. The wolfdog descended into the fdark hole leading to her small home, and brought with her some of the drinks she had been stashing. Surely, it could be used for the celebration, and she would have some more space to buy more. Shr brought the small barrel and a couple of bottles, donned the scarcely used dress, and set off to the old Church. She arrived as the others had already gathered. She approached the building's doors, her mare not too far away from her. She greeted the familiar faces, and welcomed the few that she didn't already know. However, Calia's voice silenced all conversations, and Cairina's eyes were drawn to the beautiful dappled wolfess standing next to her. She remembered Saga, of course, when she was a mere four-legged being before shifting. Now, she was a Starkhelm, just below the leaders. That was such a honor, the Hawkesond cheered at her packmate, in a clear display of the happiness she felt. As the ceremony was dismissed and the celebration was brought upon, Cairina made a beeline towards the newly promoted youth. "Congratulations, buddy!" She brushed her nose on her cheek, a wolfish salute to her now superior. "I brought something good to drink with the food" she let slip, and in a shyer voice she added "I brought one bottle just for you, but don't tell anyone." She stood back, winked at her, and walked off to retrieve the alcohol containers, still strapped to Crassus' makeshift harness. Sineria showed up with an extra grappling hook he made originally just as a spare, but once he heard about Saga's success he thought he should give it to her as a gift. He at least wanted to show his thanks and congratulations to her for everything that she has done for him and the pack. He approached the doors and opened them just at the ceremony ended and Sineria felt like an idiot for his delayed arrival. He facepalmed and groaned in humiliation and disappointment that he missed everything that had happened, and he hoped Saga would forgive him for his untimely entrance. He noticed all of the people who praised Saga for her work, and he timidly waited aside as he gripped both of his grappling hooks. He was an awkward mess already and being social was his one true weakness in life as he watched and waited off to the side of everybody. Then finally he saw an opening in the crowd, so he took it and walked up to Saga careful to not bump into anyone around him. He then took a moment to clear his throat before he looked up and waved to Saga, and smiled awkwardly with his ears flat and said,"H-Hi Saga, erm.... s-sorry for uh... b-being late." Sineria then presented the extra grappling hook he made to her and said,”Th-This is a g-gift, f-from me to you t-to say c-congrats. It’s a uh.... something I m-made for climbing. I-I can sh-show you how t-to use it l-later, b-but this is y-your moment n-not mine." Sineria then handed the hook to Saga and walked off into the corner and tried not to attract attention. Lastly, Cairina and Sineria approached one after the other. The bubbly female's well wishes came with a token of appreciation which Saga took gratefully. The dappled woman felt strange, being greeted with submission in such an open fashion, but it did not show on her face and she would quickly grow used to it. Like the other's Cairina was granted thanks in return. Sineria had apologised for his lateness, his stuttering voice meaning he took longer to extend his greetings and well wishes. She took the strange gift, nodding to him and thanking him quietly, intrigued to find out what on earth it actually was. Kenai had heard the call much like everyone else and arrived in similar fashion. She had never been to such a celebration before, but she was glad she finally got to join one. The last celebration she had was full of food, music, and socializing with her family when they celebrated the successful harvest before the winter that raged for a few months. 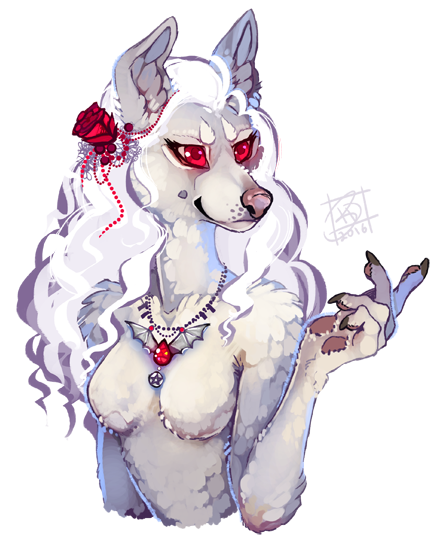 Kenai quickly got ready for it by smoothing out her fur, wearing an ivy with tiny flowers in it while her mahogany shoulder length hair was braided, and dawned on some water that was infused with some pine and other aromatic plants. It wasn't as great as a bottle of perfume, but it added a nice touch. Kenai wasn't sure about what gift she could possibly bring to Saga that would be worthy of her promotion. Was it even necessary? Kenai had only met her a couple of times and didn't know as much about her as many friends would, but still gifting something in congratulating her promotion would be appropriate. So, Kenai spent a little bit of time and decided bringing some of the food she had been growing a little bit, and the dried jerky she made, would suffice. The elk jerky was spiced a little with some salt she found, though it was very little, and sage she had grown from the garden. The food she brought was some potatoes, a couple onions, and an apple or two she found on the way. It was probably not going to be as worthy of a gift as others might give, but it came from her heart. Others had already arrived and begun celebrating with everyone. Saga sat at a nearby table talking to others and accepting gifts. Kenai was next in line and smiled. "Hello Saga, congratulations on your promotion. My gift may not be as special, but I brought some food from my garden and some jerky I made with some salt and sage. I hope you like it." she said with a smile.